If you're gonna be a douche-biscuit, at least have balls and stand by your douche-biscuitness. 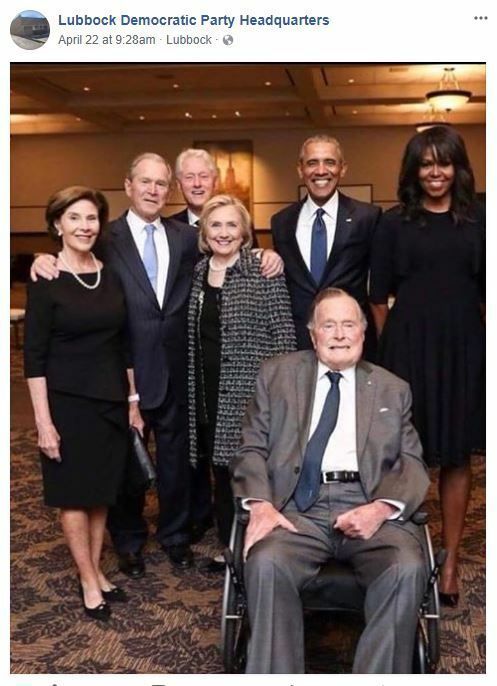 Democratic Party members in Lubbock, Texas, have been getting blasted on Facebook for cropping First Lady Melania Trump out of a now-viral picture from Barbara Bush’s funeral. The original photo features former presidents George H.W. Bush, Bill Clinton, George W. Bush and Barack Obama — posing alongside Melania and first ladies Hillary Clinton, Laura Bush and Michelle Obama. Someone at Lubbock Democratic Party Headquarters posted the edited version on Sundayand later claimed they did it by accident. But Facebook users weren’t buying it. “Childish crop job,” wrote one commenter.